NEXT | How do you feel about secrets being discovered during beta? Game history, especially the history of the development of a game, is essentially like all history everywhere — it’s the story of people. 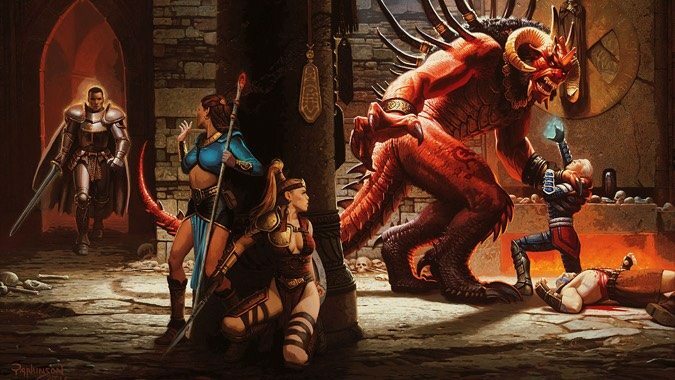 The story of Diablo 2 is the story of people working to create the sequel to a genre-defining hit game and in the process exceeding it in pretty much every way possible, while also dealing with all the personal and professional hurdles such a task entails. We players often only get to see the finished product — we only really see the final game, and not the hours upon hours of work, the design decisions, the deadlines and directives from above that go into the process. If you’re interested in how it all went down, game historian David L. Craddock has just the Kickstarter for you to back. In his Stay Awhile and Listen: Book II you’ll get the continuation of the story told in his debut volume, which covered the rise of Blizzard North and the creation of Diablo. Book II covers how we got from Diablo to Diablo 2, how Blizzard North functioned as a separate entity, and also how the Hellfire expansion to Diablo was something Blizzard very much opposed. This is more than just how the game got made, though. It’s a deep examination of the people who made them and the process behind it — an exploration of the clash of cultures between the Blizzard team in California and the more freewheeling studio mindset up at Blizzard North. I was surprised to find out just how much animosity there was between Blizzard and Sierra (and CUC, the company that owned both at the time) over the Hellfire expansion. Going so far as to deliberately write a multiplayer code for the expansion as an easter egg just to tell Blizzard off? That’s some next level sniping, and it helped produce Diablo 2, possibly the best game sequel ever made. As a lover of games and game history, this is a project that’s definitely got my attention. It’s still up on Kickstarter as of this writing, so go and check it out for yourselves.